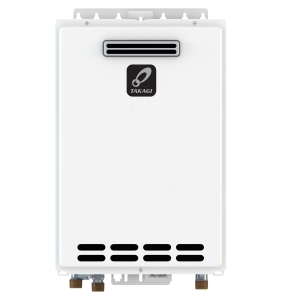 Takagi T-D2 model is coming from the non-condensing series of tankless water heaters that utilize one heat exchanger, made of long-lasting copper, and has lower energy efficiency than the condensing models, but still higher than the conventional tank-type gas water heaters. This group of water heaters, as other Takagi models, comes with the tankless technology that provides hot water on demand and in continuous supply. It can heat water directly or indirectly using the storage tank, also for space heating using the hydronic systems. There are several models available from this group, all having the same small and compact size of approximately 21”x14”x10” and lightweight design of 39 lbs. – ideal for the wall mount. All the above models are available in natural (N) and propane gas (P) and come with the low and ultra-low NOx emission (i.e. T-D2U-IN). All Takagi T-D2 models are made for the heating potable water in residential homes – even for heavy water usage, and light commercial applications, providing a water flow of maximum 10 gallons per minute, which is sufficient for two to four fixtures operating at the same time – but depending on the regions and the temperature of the incoming water. Takagi T-D2 was designed to deliver hot water up to 10 gallons per minute, but if the demand is higher, up to four T-D2 models can be linked by using the Easy-Link System – a communication cable, and without any additional parts/accessory. One unit can reach the maximum power up to 199,000 BTU or up to 796,000 BTU (with an Easy-Link System), and with the modulating gas valve, the power can get lowered to 19,500 BTU if needed, resulting in great energy savings. Models T-D2U-IN and T-D2U-OS except using the Easy-Link System, can also utilize a Multi-Link System connecting up to 20 units. The remote controller is provided with both indoor and outdoor models and it allows the temperature change (in 16 settings) from 100 F to 167F or 176 F in high-temperature mode. In a case of the Ultra-Low NOx models, the temperature is available in 13 settings – from 100 F to 160 F. The remote controller can also provide useful info about the operating status - such as the error codes during the malfunctioning. Takagi T-D2 utilize either horizontal or vertical venting, 3” or 4” vent pipe size, made from the stainless steel so it can sustain high exhaust temperatures. With the direct vent conversion kit, models can be converted to a sealed combustion system, where all the air is taken from the outside and where the products of combustion are released. The outside model T-D2-OS, like the one from the picture, is ventless - it does not need a vent system. The manufacturer provides a long warranty of 15 years on the heat exchanger if primarily used in residential applications, or shorter 10 years if the main purpose is the commercial application. 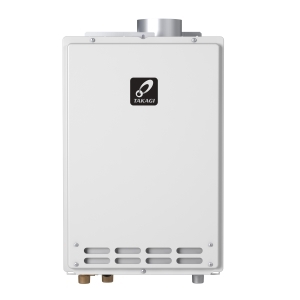 As seen from the above features, Takagi T-D2 tankless water heater can be used in high-demanding residential and light commercial applications, potable water and space heating, including the recirculation systems. It is not as efficient as the condensing models, but it is less expensive and still very tough with the built-in aluminized stainless steel burner and heat exchanger made of the commercial grade copper alloy.